This traditional, old-fashioned recipe for Crockpot Beef Brisket cooks slowly in your slow cooker for a satisfying and warming dinner. This is the perfect dish to make on a cold winter weekend; the aroma that drifts through the house as the meat is cooking is incredible. Brisket is a tough cut of meat since the animal uses it a lot, so it must be cooked with liquid, and slowly for a long period of time. This recipe makes very tender meat with a fabulous flavor that is rich and deep. You can change the vegetables you put into this recipe with ease. Add some sliced mushrooms, add more garlic, stir in some cubed Yukon Gold or russet potatoes, or add some cubed parsnips. Toward the end of cooking time, you could add more tender vegetables, including bell peppers, zucchini, or frozen peas. Serve this warming and comforting dish with a simple green salad tossed with mushrooms, grape tomatoes, sliced avocados, and a balsamic vinaigrette dressing. For dessert, a chocolate cake or brownies would be perfect. Serve this menu often during the cold winter months. Place the onions in the bottom of a 5 to 6-quart slow cooker, then place the brisket, fat side up, on top of the onions. Sprinkle the garlic on top of the beef. Surround the meat with the chunked carrots, and any other root vegetable you'd like. Combine the ketchup, vinegar, brown sugar, salt, marjoram, and pepper in a small bowl and then rub into the beef. Pour 1 cup water into the slow cooker over the vegetables; don't pour over the meat, or you'll wash off the seasoning mixture. Cover the crockpot and cook on low for 8 to 10 hours or until the meat is very tender. 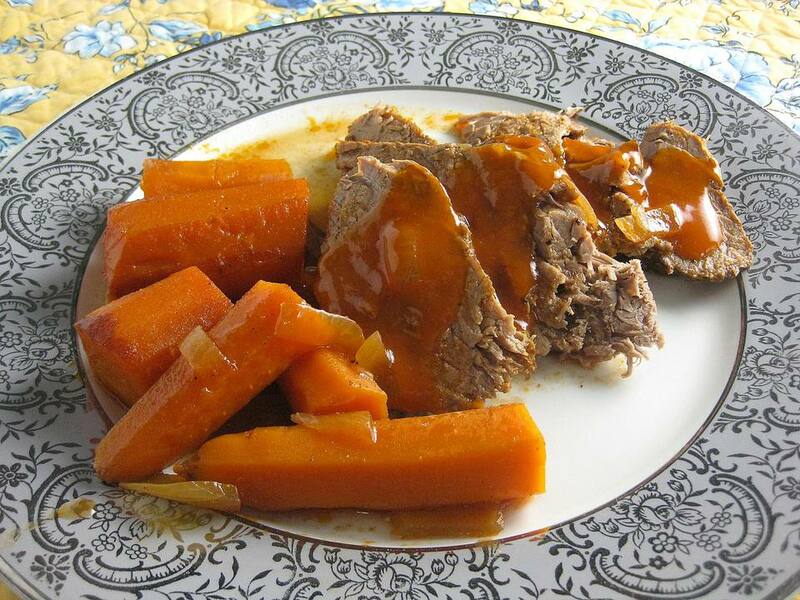 To make the gravy, remove the brisket, onions, and carrots and any other vegetables from the slow cooker, place on a serving plate, and cover tightly with foil to keep warm. Pour the liquid from the crockpot into a large saucepan. Mix the flour with 1/2 cup water, add to the saucepan, and bring to a boil, stirring the gravy frequently with a wire whisk. Boil until the gravy is thickened; then add the Worcestershire sauce. Season the gravy with salt as needed until the flavor comes to life. Slice the meat and serve with gravy, onions, and carrots.